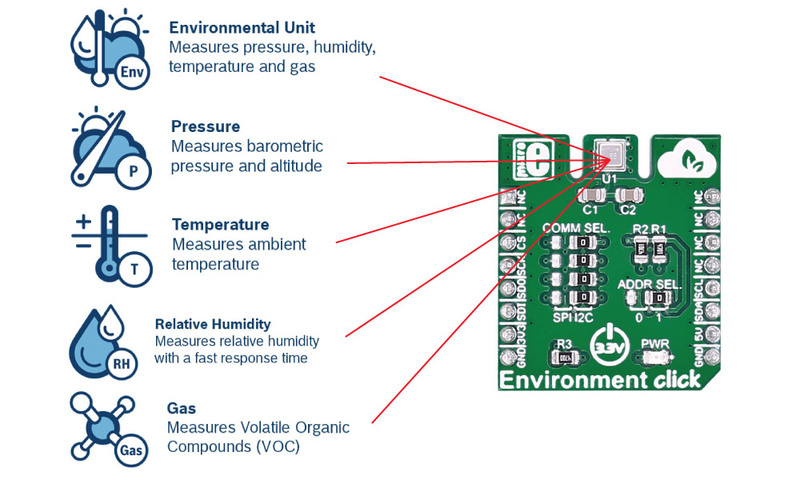 Environment click measures temperature, relative humidity, pressure and VOC (Volatile Organic compounds gases). 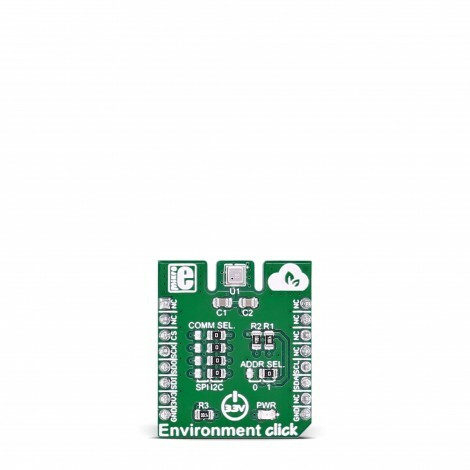 The click carries the BME680 environmental sensor from Bosch. 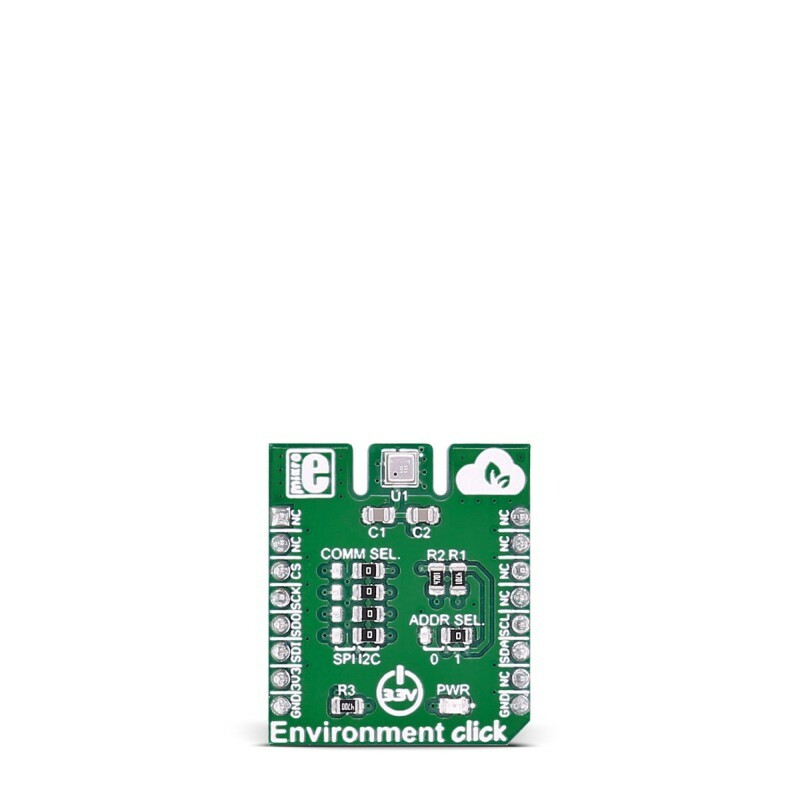 Environment click is designed to run on a 3.3V power supply. 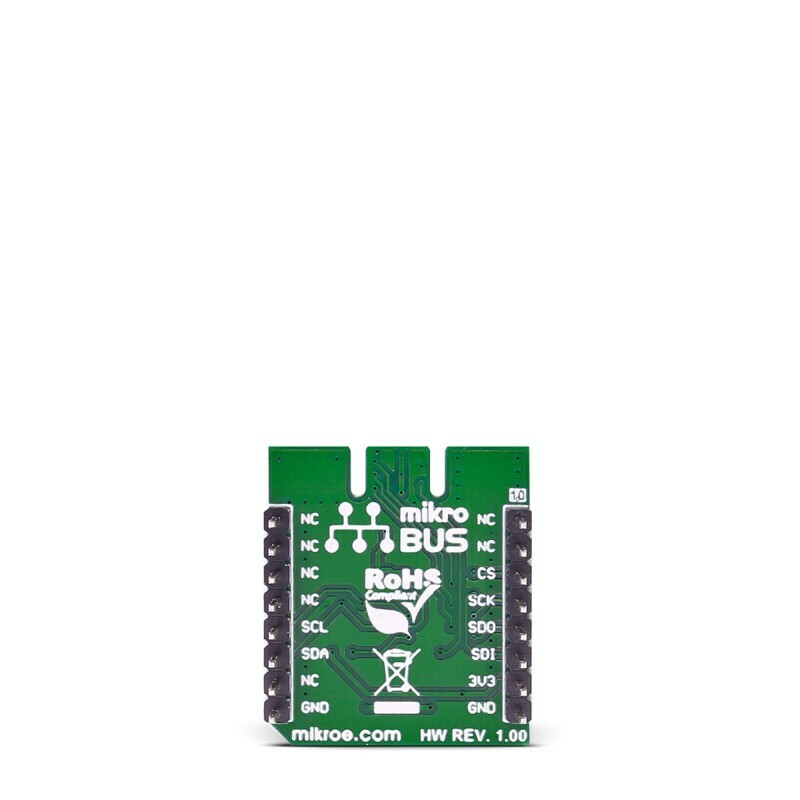 It communicates with the target microcontroller over SPI or I2C interface. You can use it to test your indoor air quality, to control HVAC (heating, ventilation, and air conditioning) systems, in a weather station, sports applications and more. 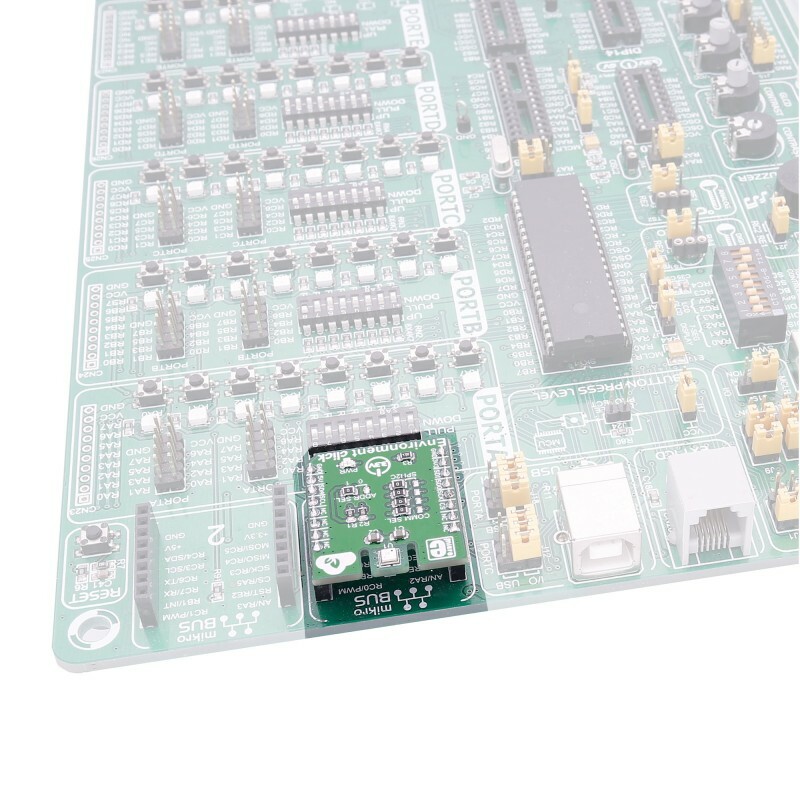 The BME680 is as combined digital gas, humidity, pressure, and temperature sensor based on proven sensing principles. 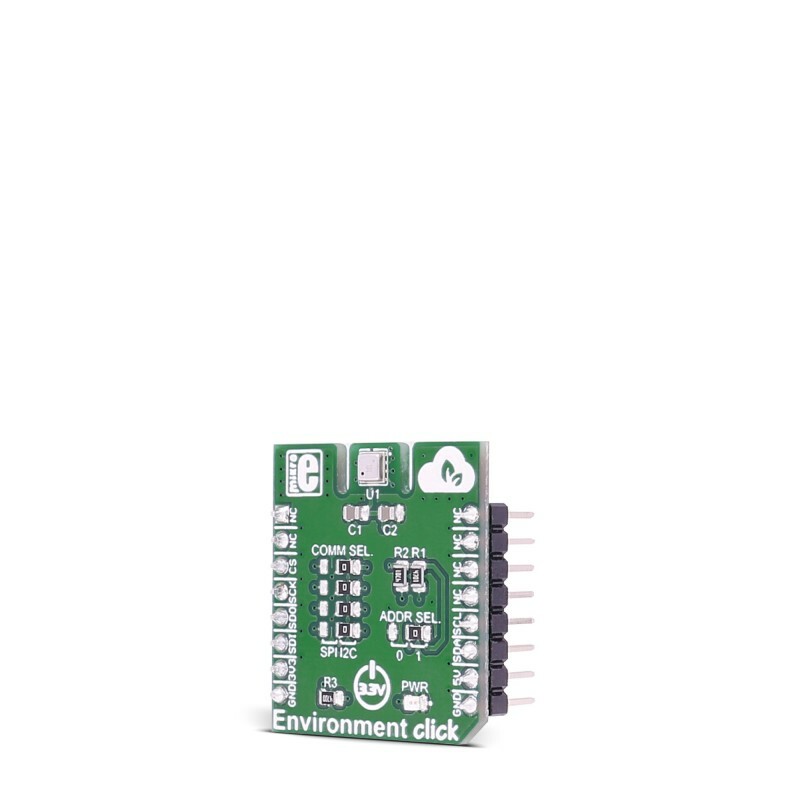 The humidity sensor provides an extremely fast response time for fast context awareness applications and high overall accuracy over a wide temperature range. The pressure sensor is an absolute barometric pressure sensor with extremely high accuracy and resolution. The gas sensor within the BME680 can detect a broad range of gases to measure indoor air quality for personal well being. Gases that can be detected by the BME680 include Volatile Organic Compounds (VOC) from paints (such as formaldehyde), lacquers, paint strippers, cleaning supplies, furnishings, office equipment, glues, adhesives, and alcohol. Applications Indoor air quality measurement, personalized weather station, home automation control, measuring ambient temperature, etc. This table shows how the pinout on Environment click corresponds to the pinout on the mikroBUS™ socket (the latter shown in the two middle columns). Code examples for Environment click, written for MikroElektronika hardware and compilers are available on Libstock. The Libstock page for the Environment click offers a library for temperature, humidity, and pressure readings. To get the library for air quality (VOC) measurements, visit the Bosch website and download the VOC library file for mikroC (libalgobsec.emcl). The run-in phase for VOC measuring is approximately 5 minutes. Note: Once you go to the Bosch website, you will need to read and agree with the terms of the software license agreement, before you can download the VOC library. For more information about the Environment click library, see our Libstock page. The following code reads the procedure on the I2C bus (PIC32MX).